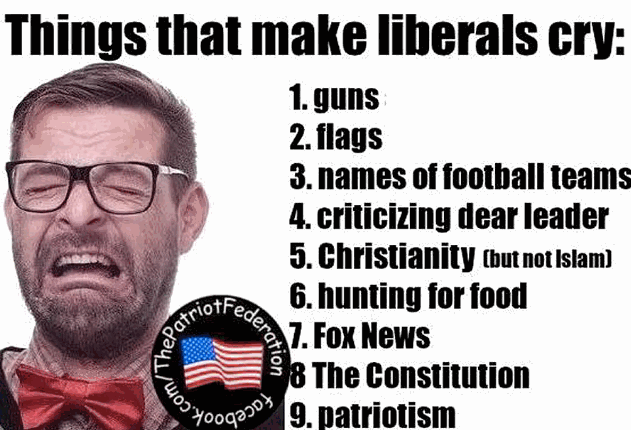 Actually , none of these make liberals cry. 1) Liberals also own guns. The idea that liberals in general hate guns is absurd. Many Conservatives are gun nuts , who believe that even the most moderate forms of gun control are an infringement on their second amendment rights ; liberals tend to be more rational when it comes to firearm regulations. 2) Just as many liberals also love the flag. The notion among Conservatives that liberals are not patriotic and don’t love their country , is also laughably absurd. 3) Most liberals don’t care what football teams name themselves. 4) Many liberals have criticized Barack Obama when he does something they don’t support. The notion that all liberals blindly worship and approve of everything he does , is laughably absurd. Conservatives who hate him , are not paying attention. 5) Many liberals are Christians themselves , and are highly critical of Islam. Conservatives have a real problem labeling all Muslims as terrorists , hence the absurd phrase , ‘not all Muslims are terrorists , but all terrorists are Muslims ,’ which is contradictory. They also have a problem defending white nationalist terrorism like some liberals do with Islam. 6) Many liberals also hunt. 7) No rational liberal would watch Fox News , so that one is correct. 8) Again , the idea that liberals hate the Constitution , is ridiculous. 9) Conservatives believe they have a monopoly on patriotism. They believe that hating Democrats , liberals , Barack Obama , Hillary Clinton , amassing hoards of firearms , and wrapping themselves in the flag while denying civil rights to others , makes them patriots. Moderate , reasonable gun control. Whaaa! Anyone who doesn’t display extreme nationalism , such as standing for the National anthem ; anyone who criticizes police brutality involving the death of an unarmed black individual. Whaaa! Anyone who criticizes Der Furher Donald Trump. Whaaa! Anyone who criticizes Christianity. We’re so oppressed! Whaaa! Anyone who criticizes Fox News. Whaaa! Anyone who doesn’t hate Obama , liberals , Democrats , and gays. Whaaa! Anyone who doesn’t hate Muslims. Whaaa! Anyone who criticizes Israel’s imperialism. Whaaa! Anyone who criticizes Americas imperialism. Whaaa!